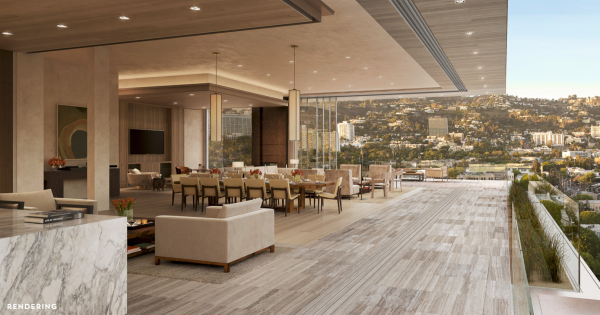 A rendering of the view from a multi-million condo planned for 8899 Beverly Blvd. One of Townscape Partners’ two controversial West Hollywood-area projects may face a slight delay. The Los Angeles Cultural Heritage Commission (LACHC) yesterday voted to consider the Lytton Savings and Loan building at 8150 Sunset Blvd. for designation as a historic cultural monument. The building, now a Chase bank, was designed by Kurt Meyer in 1960. It is located on the site of the Garden of Allah, the estate of legendary actress Alla Nazimova, who turned the 2.5 acre estate into a hotel in 1926. Townscape plans to demolish the building, which is on the southwest corner of Sunset and Crescent Heights boulevards, as part of a Frank Gehry-designed project with five buildings with a total of 249 housing units and retail and other commercial space. Townscape has offered to make 28 of the housing units available to lower-income people in exchange for permission to triple the allowed building size. The Los Angeles City Planning Commission recently approved Townscape’s plans in exchange for its agreeing to add ten more “workforce” housing units, which are defined as housing for families of four whose income is roughly between $56,000 and $67,000 a year. If the LACHC decides to designate the bank building as a historic cultural monument, it can delay issuance of a demolition permit to Townscape for 180 days. That period can be extended another 180 days with the approval of the L.A. City Council while preservation alternatives are explored. In any case, the project now will go before the L.A. City Council’s Planning and Land Use Management committee and, if approved by it, to a vote of the L.A. City Council. The 8150 Sunset project has drawn opposition from residents of West Hollywood, on whose northern border the project sits, and from the City of West Hollywood. The city’s concerns have centered around the impact of traffic from the development on nearby residential areas. Townscape’s other controversial project, at 8899 Beverly Blvd. in West Hollywood, is proceeding, with the West Hollywood Planning Commission last night agreeing to cede a 10-foot wide strip of land behind the existing building to the developer. The land, bordering Rosewood Avenue, had been set aside for a possible expansion of the road, which no longer is under consideration. However it appears that Townscape, which plans to nearly double the size of the 8899 Beverly building (which already is twice the size of what’s currently permitted under zoning for the area), may be cashing in on its investment in the property. In April 2015 the West Hollywood City Council, in a 3-2 vote, approved Townscape’s expansion request. That approval came after a long battle with homeowners in the neighborhood to the south of the project, a battle that included Townscape spending thousands of dollars to support the candidacies of City Council members who voted for the expansion — John Duran, John Heilman and Lindsey Horvath. WEHOville recently learned that CBRE, the commercial real estate firm, this past Spring was soliciting money from investors, with rumors that Townscape, which is headquartered in Beverly Hills, and its investment partner, Angelo, Gordon & Co. of New York, were trying to sell as much as a 90% stake in the 8899 Beverly project. Townscape’s publicist did not response to WEHOville’s request for a confirmation of that percentage. The brochure pitching the investment can be downloaded online. The CBRE brochure says the 8899 Beverly project will include 48 condominiums and nine single-family homes. It also will include 10 apartments for low- and moderate-income people, which will be segregated on a single floor. Those apartments were required by the city in exchange for approving the expansion. It has not been uncommon in West Hollywood for developers to lobby the City Council for exceptions to existing zoning and planning ordinances and, once the exception is granted, to sell the property, whose value has increased substantially with the zoning change. Actually …. I realize the desire to convert to residential. Back in the mid 1990’s the unforeseen consequence of the digital era was a sudden and growing to date, was the lack of need for Office Square Footage ….. Across the board. Downtown Skyscrapers were suddenly 1/2 to 2/3 empty. The digital era has hit everybody and every business. The business of commercial office space has a GLUT of vacancy – note – our really BEAUTIFUL (relatively new) RED BUILDING remains almost empty. Hence I just realized why owners/investors want to convert this older office building to housing. huh … just realized the motivation. go figure. @TOM. SERIOUSLY PLEASE FOLLOW THROUGH. You are the only person I’ve heard with any knowledge and or Experience on how to GET THE PROCESS STARTED. I wonder if copies of a wall-sized version of the overhead Weho to Beverly Hills photos can be purchased anywhere. They are really beautiful, and it would be interesting to take the same shot at 10 year intervals to see how it changes. Let’s go for it. A committee is better than one. Let’s go after the Townscape Three… Duran, Horvath and Heilman! Join up with Tom! I really think it is time for concerned citizens in WEHO and Los Angeles make a complaint with the FBI re the Townscape scam.. I did this in Colorado and we met. The FBI nvestigated and prosecuted. Weho coukd become the next City of Bell if the watchers don’t act! Political corruption, selling favors, etc, is not something the FBI likes. The Angelo, Gordon Townscape connection with Trump and Gov Chris Christie is a red flag. It appears the WEHO council people who are lapdogs for Townscap could care less. Townscape Angelo-Gordon, because of political contributions and close ties with John Duran, loathes the one percent. Duran, the Grinder spokesman, is the Townscaoe flack for getting things done. Why are Heilman and Horvath apart of this cobal? So Tom, what are you waiting for? Connect your dots, call or drive your self over to the Federal Building with your paperwork and have a chat with the FBI. No sense telling somebody else to do your job. That is, if you have the courage of your conviction. If there is a legal path, I agree. It might be beneficial to our city if we considered discouraging such blatantly speculative profits that create no benefits to residents by making all exemptions and entitlements non-transferrable. Just another high stakes manipulated revenue stream creating even more distance between the project and the community. This is no longer “Community Development” as it was once known. Yes, let’s focus on the integrity of the process. Todd you are so right. Many of these developers are not building these properties, they are selling off the entitlements. When the number of large projects that are sold off start to outweigh the projects that are actually built its time to re-look at variances issued. In the case of 8899 Beverly, after much debate, not a single council person acknowledged that easement and when the election drama died down a poor floor took the place of the poor door. The politics of it all is enough to make one question the integrity of the process. I not surprised that they are shopping this project out. I think the condos project on Doheny was sold by Faring after the approval. The Melrose Triange project seems frozen. Was mother sold? The Sprouts project is MIA. Walgreen’s sold its long fought for project at SMB & Crescent Heoghts to the city. The West Knoll project is behind schedule. The San Vicente Inn redo was supported by the community and it’s nowhere in sight. Lots of effort into getting a development approved then it is sold or doesn’t happen.